TLM LIVE environment > North Shore Vein Center > Blog > Varicose Veins > What is sclerotherapy? Injection Sclerotherapy is an in-office procedure where veins are injected with a solution, using small needles, which causes them to collapse and fade from view. The procedure typically improves not only the cosmetic appearance but associated symptoms as well. The procedure normally takes about 30 – 40 minutes, depending on how many spider veins are treated. Since the injection needle is so small, patients often feel little pain and do not require any anesthesia. Because there are many veins in the leg, the blood that would have flowed through these vanquished spider veins simply flows through other healthy veins after the procedure. The loss of the diseased vein is not a problem for the circulatory system. Sclerotherapy is a treatment for the removal of spider veins and smaller varicose veins. Sclerotherapy is the most popular choice of doctors and patients for spider vein treatment because it is more effective, less expensive, and less painful than any other treatment available. You can enjoy healthier, more attractive legs. Once the veins are treated they will not come back, but because spider veins can be a chronic condition, new ones can form in the future. However, because the initial treatment is so thorough, and all associated “feeder veins” are treated, any new veins tend to be minor. Simple yearly touch-up treatment can help you enjoy your life free from unsightly veins. The solution can be in a liquid or a foam form. Foam Sclerotherapy is a safe and effective method for treating troublesome varicose veins Foam sclerotherapy has two distinct advantages over traditional sclerotherapy procedures. Because the sclerosant agent is in a foam form, it is able to displace the blood in the vessel being treated, which means the sclerosant formula is able to be in direct contact with the vessel wall for a longer period of time, allowing it to work more effectively than liquid agents which may be diluted by blood flow. Also, the foam is visible on ultrasound, and its placement, spread, and effects can be guided and tracked more effectively as a result. Foam sclerotherapy has few side effects, but compression hose should be worn for at least 2 weeks after treatment. It typically takes about six weeks for the veins to disappear completely. 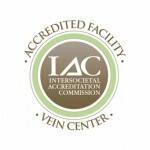 The number of sessions required depends on the depth, number, and size of the veins being treated. While some patients are happy with the results after just one treatment, others may desire further injections for the optimal effect. Normal activities may be resumed immediately. Secondary treatments, if needed, should be scheduled six to eight weeks following the primary treatment. You will be asked to wear a compression stocking to help keep pressure on the veins. This will reduce bruising and keep the treated veins closed. Bruises around the treated areas usually disappear after the first week. Any discomfort can be easily managed with over the counter pain medications. Walking is important, as it increases blood flow through the other veins. Most patients will experience a 60% to 80% percent improvement. Final results may not be apparent for several months.